Then choose Tools > Addons > Create Photo Album. Note: See also a related article I wrote for TechTarget.com on creating presentations in OpenOffice.org 2.0. Printing handouts is a little more complicated than it needs to be. Here's the quick description. 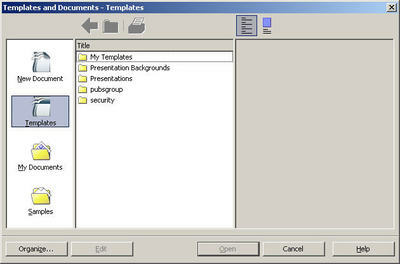 With a presentation open, choose File > Print, then click the Options button. In the upper-left Contents quadrant of the Printer Options window, make sure only the Handouts option is marked. Then click OK and print from the Print window. Here's the full answer, however, to how to print handouts from soup to nuts in 1.x and 2.0 versions of the software. First, create your presentation and get it how you want it. 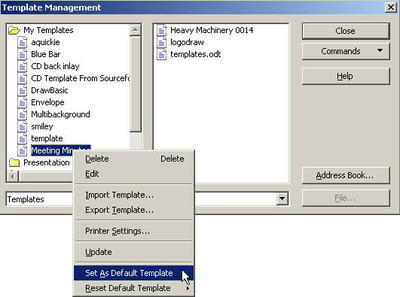 Choose View > Master > Handout or click the Handout View icon on the right side of the work area. You'll see the layout window where you can see how many slides you'll have on a page. Choose Format > Modify Layout. You'll see the Modify Slide window where you can change the number of slides on a page. Select a different number if you want and click OK. The default page layout is Landscape. If you want Portrait (vertical), choose Format > Page and select Portrait, then click OK.
Back in the main layout window, drag the slide placeholders to different locations if you want to change where they are. If you want horizontal lines for people to take notes on, you'll need to use the line tool to draw a set of 3-4 lines by the first slide yourself. To make them even after you've drawn them, select them all and choose Alignment > Right (or Left, or Center). Click the image to see a bigger version if you want. To distribute them evenly after you've drawn them, select them all and choose Distribution. Choose Vertical and Center. Then copy that group of lines when they're how you want them (might want to group them first), and copy the lines to the other slides on the page. 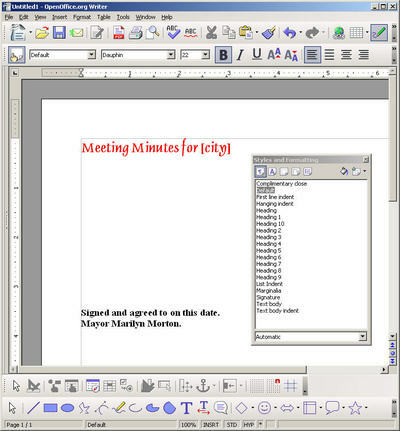 If you want a page number at the bottom of each piece of paper (not every slide), use the Text tool to draw a text box at the bottom of the page, and type the word page if you want. Then choose Insert > Fields > Page Number to add an automatically incrementing page number. Now that you've done the setup, you're ready to print. In the Contents section of the Printer Options window, make sure that only the Handouts option is selected. The default is for Drawing to be selected and that's all. That means you get one big slide per page. You absolutely must select Handouts here to print handouts. If you leave Drawing selected, your printer will also spit out a printout of your presentation with one slide on every page. Click OK in the Printer Options window to save the changes and close the window. That's all! That last part is the secret. Getting to the layout window was too complicated, and setting up the note-taking lines was a bit of a pain to do manually, though at least those lines will stay there now that you've done them. But the last part, marking Handouts, is the main tricky thing that is really hard to find. It's a lot like printing handouts in 1.x. Read through that section if you haven't already. I'm going to go over the few differences here. This is simpler and different than 1.x. In your open presentation, just click the Handouts tab above the slide view. In the slide layout view that appears, you want to look to the right and find the Layouts tab. Now choose the number of slides you want per page. This is the same as 1.x. See the 1.x setup and formatting section. This is the same as 1.x. See the 1.x printing section. 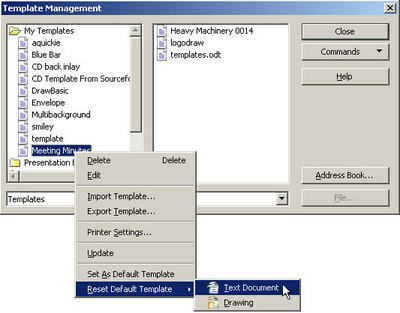 As before, be sure to select just the Handouts option in the Printer Options window.